I think it’s time for some chocolate around these parts don’t you? Between traveling to Wisconsin and wrangling my crazy active toddler (how is he a toddler! ?,) I feel like this page has been needing something rich, decadent, gooey and scrumptious- so here you go! This cake is all of those things. So rich, with a dense brownie-like outer layer and a gooey molten center. 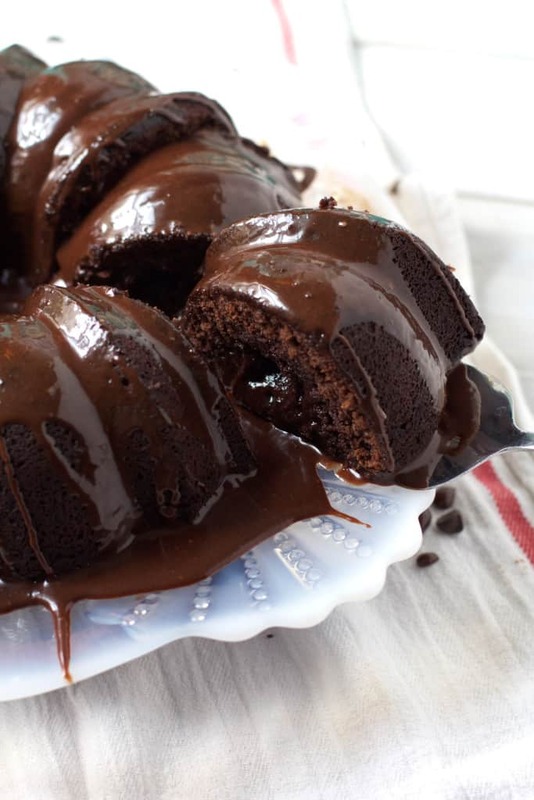 Topped with a bonus chocolate glaze this whole recipe is out of this world. This cake is truly a chocolate-lover’s dream. If you let it cool for a few hours, the filling will firm up and be more dense and fudgy. If you are as impatient as I am and choose to cut into it a little sooner, the inside filling will still be gooey and ooze out of each slice like those individual molten cakes. I have no idea how this happens since there is only one batter for this cake and no filling. I assumed that in order to get a filling like this I’d have to fill the cake with hot fudge or something but no! Right out of the oven you can see two separate layers, one looking crackled like the top of a gooey brownie and then a more cake-like part. I love these crazy baking mysteries. I tried to figure out the magic of it for awhile, but in the end realized sometimes too many questions is a bad thing, and decided to just let this be one delicious mystery! Preheat oven to 350F. Melt the butter and mix with the cocoa powder for the pan. Use a pastry brush to coat the inside of the bundt pan- set aside. In a small bowl pour the hot coffee over the dark chocolate and let sit for a minute before stirring until smooth. In another small bowl or liquid measuring cup, whisk together the eggs and vanilla. Stir together the flour, cocoa powder, powdered sugar and salt in a third bowl. With the machine running on low, slowly add the dry ingredients and mix until the batter is smooth with no streaks of dry ingredients but don't over-mix. Pour the batter into the prepared pan and smooth the top with the back of a spoon. Bake for 45 minutes or until the edges of the cake pull away from the pan. Let cake cool in the pan for an hour and then invert onto a wire rack. To fully set the filling cool the cake 2 hours more, or you can speed this up in the freezer. In a small saucepan combine the chocolate, cream, and corn syrup. Cook over low heat, stirring constantly until smooth and melted. Allow glaze to cool and thicken for about 20 minutes (or speed it up in the freezer,) and then drizzle it over the cooled cake. Allow the glaze to set before serving the cake. *You could also use dark chocolate chips. Currently wondering how soon I can get into the kitchen and make this! Bundt cakes are so satisfying to make when they come out looking perfect. A really impressive dessert. This one looks easy to make and I love how you added coffee to the batter (my fave)!! Oh how I would’ve loved to make this for Tata. It does look like a perfect dessert for a chocolate lover, and it will be next on my list when baking for one. Thanks for sharing! Oh my goodness, does this cake look decadent and delicious! Like you, I love a good bundt cake, but I rarely make them. I definitely need to change that soon and will have to make this since I’m intrigued by the molten lava center! I cannot make this soon enough! That gooey center is killing me! So beautiful and delicious! 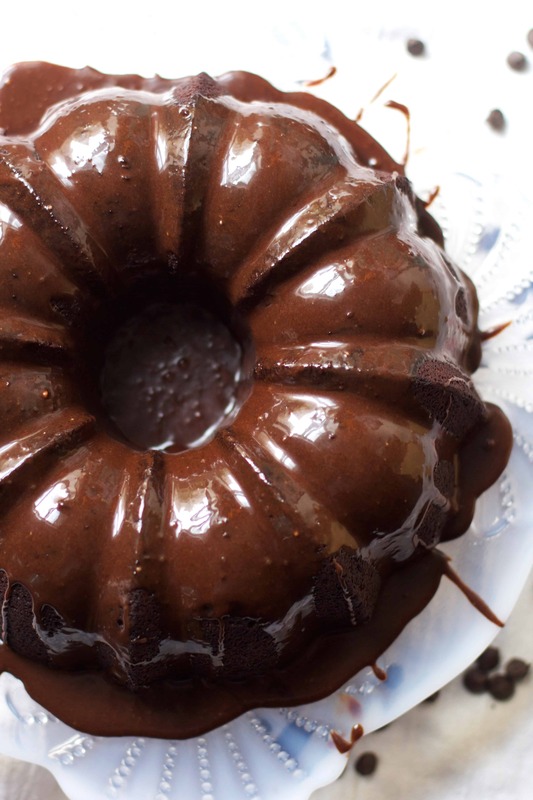 It’s been ages since I made a bundt cake, and I think that needs to change. I’m sorry I just drooled all over your blog, but seriously — THIS CAKE. It’s chocolatey perfection. Loooove that topping! This cake is a beauty! I can’t wait to go home today and try this cake. My family love anything chocolate is one is going to beat my ever famous chocolate cake. Perfect way to end a day! This is chocolate CRACK. And I definitely want to fuel my addiction with multiple slices. Oooh wow, it is definitely time for chocolate when it looks this good!! Love how shiny that glaze is too! What size bundt pan is it? Thanks. So is dark chocolate the same as unsweetened Bakers chocolate? That is what I used. I had to add powdered sugar and double the cream and corn syrup to make the glaze pourable and sweet. What do you use? So let’s chat about this hot coffee! I love coffee by itself but but coffee flavored foods or desserts. Does thus have a hint of coffee flavor and us there a substitute? HI, I’m wondering if the butter is 2 1/2 sticks of the “1/2 cup” short sticks of butter? I want to make sure that I’m not using the wrong amount. Can this cake be prepared in a round cake pan? Do you spray the pan with Bakers Pam? I always spray or grease a bundt pan before baking! Will this cake freeze well with that yummy, gooey center? I made this and it’s really, really chocolately and tasty! However, I only cooked it 40″ and pulled it out of the oven then as it was clearly pulling away at the sides–and I think I left it in too long. It was dry and the fudgey part was not as moist as expected. So I would suggest starting to check it at the 30- 35″ mark to ensure it isn’t overcooked. I do on making it again–but not cooking it as long. We made this today, halved the recipe for a 6 cup bundt pan. It came out tasting great. The texture is more like a brownie than a cake. 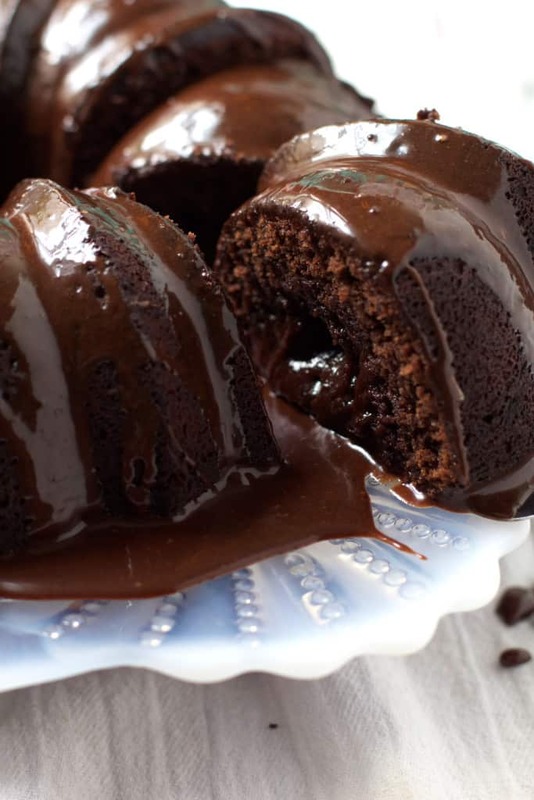 I spend much time coock several recpie to match choclate cake i eat in past, that is one is match!! But i have q. There is no Baking soda or powder! I am the only person on this list with a complete fail. I made the cake exactly to the recipe. I inserted a knife at 45 min, it came back smeared and not clean but I took it out anyway to follow the recipe. I cooled the cake in the pan for almost an hour and a half. I inverted it onto a wire rack, the entire cake collapsed with chocolate goo all over the counter. Horror. I rushed it back into another cake pan and cooked it for another! 45 minutes to a knife inserted in the center came out. At this point, it was a brownie disaster cake. I dropped it into a serving bowl, smoothed the top with frosting and it still tasted good — but yuck, to look at. I make pretty complex layer cakes. This was supposed to be a breeze. NOT! When you say to set the filling two hours more, do you mean in the pan? Also, can the undercooked gooey collapse — I hate gooey centers — be avoided simply by baking until a knife comes out clean, cooling longer in the pan, inverting onto a plate — not a wire rack — and then in the freezer? What do you advise? I want to try it again but fear another debacle. So 45 minutes in my oven may not be the same as yours. As your oven been calibrated? Sometimes ovens run several degrees off so I’d try that first. This cake is meant to have a gooey center. If you don’t love that- make a classic chocolate cake would be better? 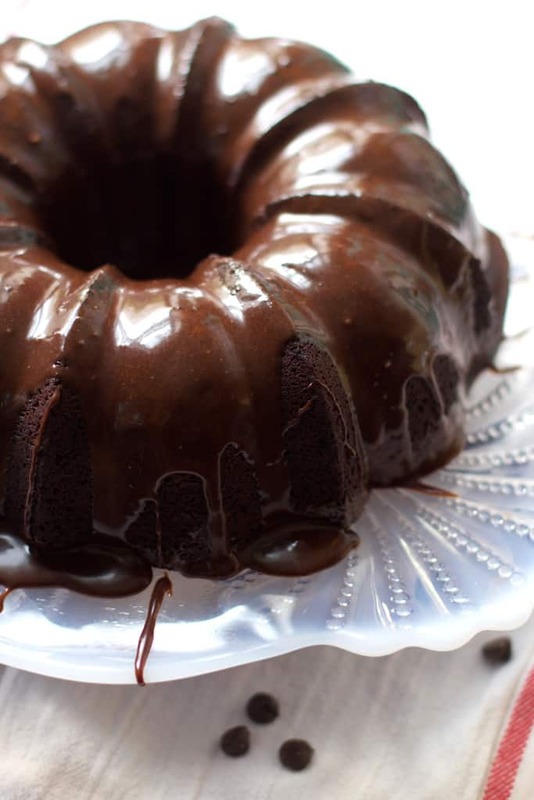 I have a wonderful one-bowl chocolate cake that is very easy and delicious. Next time I would let the cake fully cool before inverting. For me that took an hour. After 90 minutes was it still warm? If it collapsed I’d say it wasn’t done baking. Did the edges all pull away from the pan? So YUM!! I used semi-sweet chocolate instead of dark. But my cake did sink after inversion (baking 45 minutes and cooling in the pan one hour). Next time it needs 5-10 minutes more baking time, and I need to rotate the pan 1/2 way through. I should have practiced this ahead of time due to oven and pan variances. The cake did come out of the pan easily. Also, although I made the glaze, I did not add it- I think it would have been too rich. I served it warm (after cooling 1 hour in the pan) with vanilla ice cream. It wasn’t the prettiest cake but was a huge hit!